The history of the valley is closely tied to the development of several irrigation projects. In 1887, the Snake River Land Irrigation Company of Rhode Island began construction of the dam on the Bruneau River to provide water for the valley. The dam was washed out by flood water in 1890, but was rebuilt in 1892 by the Owyhee Land and Irrigation Company, also of Rhode Island. But promoters were not a able to develop the land until the turn of the century. In 1910, the Bruneau Dam again broke and the Grand View Irrigation District was formed to reconstruct the dam. Early promoters were also aware that there was gold in the Snake River. In 1892, 26 placer mining claims were filed on the Snake River in the vicinity of Grand View. By 1904, Grand View boasted two ferries that were busy taking travelers and freighters across the Snake River. Established prior to 1894, the Hall Ferry crossed the Snake River several miles above the mouth of the Bruneau River. The Dorsey Ferry at first worked the Bruneau River near its mouth. After several years it moved to the Snake River. It became the nucleus for the town sometimes called Dorsey and later named Grand View. In 1921, the town痴 first bridge was constructed a few yards upstream from the Grand View Ferry. In 1909, a third crossing, the McKeeth Ferry, began operation six miles down river from Grand View and continued service until 1939. Raising hay for the many sheep companies that wintered in the valley helped to develop the area. The Elmore Times in 1915 estimated 150,000 sheep were fed that winter. The area was promoted for raising fruit, berries and melons. 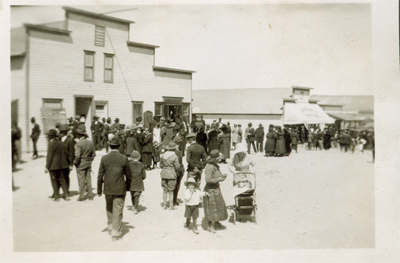 The years from 1910 to 1921 saw continued growth of the town with the construction of the two-story brick bank building , a dance hall and ice cream parlour, two general stores, a saloon and pool hall. a four-room brick schoolhouse and several other businesses. 2019 City of Grand View, Idaho.